Maybe we can start another jetting data base? Replace your standard slotted air screw with a extend adjustable thumb screw version like this, this allows you to reach down and adjust the air screw without shutting the motor off or getting off the seat. The air screw makes a huge differance on the off idle performance. Once you have one you will always have one of these. Where can I order them air screws? Motor won't idle and idle set screw is ineffective. Try leaning out the air screw by turning it counter clockwise a quarter turn at a time. If the air screw has no effect, install a leaner pilot jet and return the air screw to 1 turn out. Proper air screw settings are usually between 1 and 2 1/2 turns out. The correct pilot for your bike is one that allows instant off-idle throttle response, and allows the air screw to be effective between 1 and 2.5 turns out. If the problem still exists, check and clean the choke circuit and carb vent lines. Motor stumbles off idle to 1/2 throttle, then cleans up. If everything in part A above is correct, check the needle. Stock position is usually in the middle, but check your owner's manual to be sure. To lean out the needle, you need to raise the clip. If the needle is dropped all the way lean and problem still exists, try a leaner needle. Motor will rev through the mid range then becomes gurgley (technical term) at full throttle and power is sluggish. This is a text book example of a rich main jet. This problem often occurs when an air filter becomes clogged and gets worse as the motor heats up. Choose a main jet with a smaller number and lean out the air fuel mixture one step at a time. If the problem still persists even though it's improved a little, reinstall your original main jet and lean out the needle one position. Now fine tune the main jet with plug checks. Motor hesitates off idle with a "Boooooooooowang" sound. This is a lean symptom and often occurs when a motor is cold. Try turning the air-fuel screw clockwise a quarter turn richer and check throttle response again until motor revs without hesitation. If the motor "hangs up" or doesn't come right back down to idle, install a richer pilot, and reset air screw. Motor knock knock knocks at idle when hot. Try solution A. If problem persists, perform a "leakdown pressure test" to check for ignition crank seal leakage. Motor revs clean and crisp but runs really hot and lacks power. This symptom indicates a lean main jet and/or needle. Use a richer main jet and/or needle setting. This is the most common misconception about two stroke jetting: When a motor runs excessively hot and lacks power, it is on the verge of seizing. If you are on the trail and don't have the right main jet, try raising the needle by lowering the clip. It won't be exact but at least you won't seize. Note: To be certain that your problem is lean, pull on the choke and see if the problem gets better or worse. If better, your problem is a lean condition. 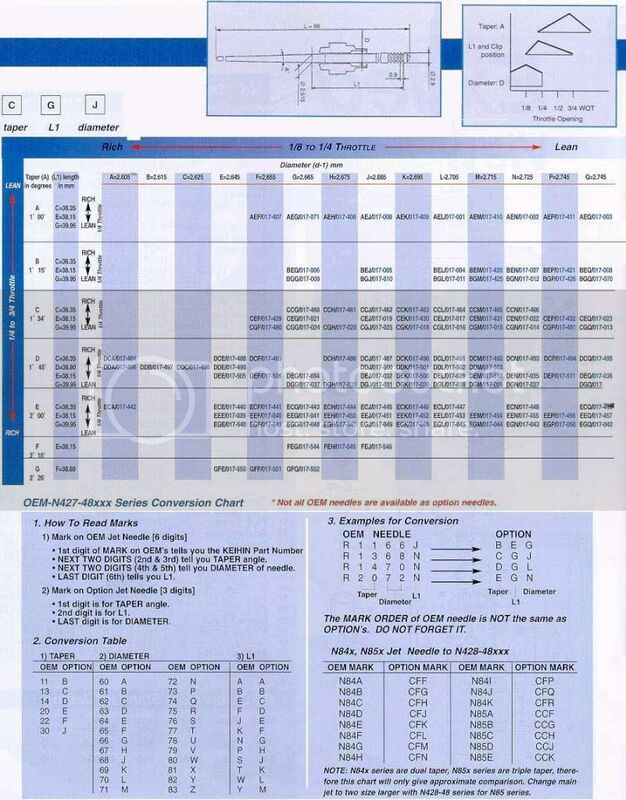 [/HR][h=3]Keihin Carburetion Jetting[/h][h=3]AIR SCREW:[/h]The air screw is a small (5mm in diameter) slotted brass adjustment screw located on the inlet side (air filter side) of the carburetor. The airscrew is a fine-tuning adjustment designed to allow the carburetor to be slightly adjusted for variances in atmospheric conditions. 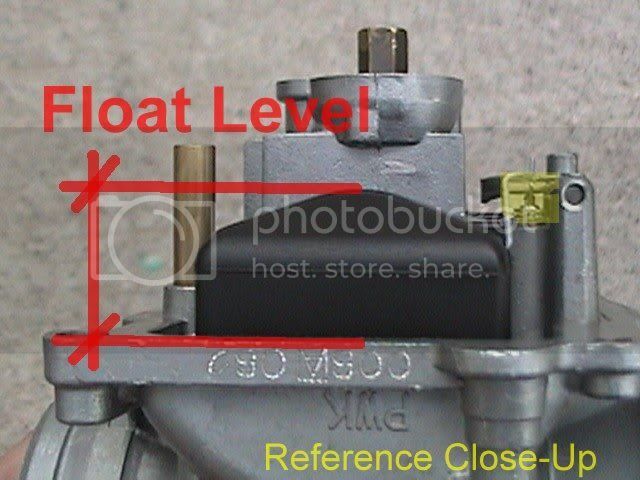 The airscrew works with the pilot/slow speed system of the carburetor, mainly affecting the engines initial starting, idling and initial power delivery. Proper adjustment of the airscrew can offer direct feed back on the necessary setting required for the pilot jet. The airscrew is adjusted in a rather straightforward manor. The ideal procedure for setting the screw in the correct position is to warm up your ATV engine to the proper operating temperature. Then turn the idle up so it is idling about 500 RPM’s higher than normal. Next turn the airscrew all the way in until it bottoms out, once bottomed out slowly back the screw out a ¼ turn at a time (give the engine 10-15 seconds between each ¼ turn of the screw, to allow the engine to catch up with the adjustments). Continue backing the airscrew out until the engine idles at its highest RPM. The preferred setting window is between 1 and 2 turns. 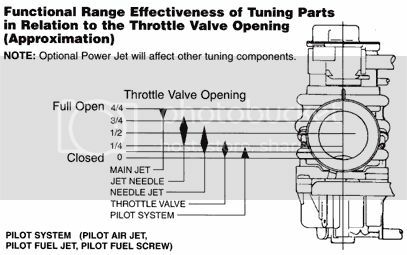 If the engine idles at its highest RPM from 0-1 turns out this means the pilot setting is on the Lean side and a larger pilot jet should be installed. If the engine idles at its highest RPM at over 2 turns out, this means the pilot setting is on the Rich side and a smaller pilot jet should be installed. If you get no RPM fluctuation when adjusting the air screw there is a very realistic chance that there is something clogging the pilot/slow speed system. Clean the system thoroughly with contact cleaner and blow out with compressed air. Carburetor must be disassembled. If the airscrew adjustment process is unsuccessful and leaves you confused. Set the screw at 1 ½ turns out and consult a professional for further assistance. [h=3]PILOT JET:[/h]The pilot jet is a medium size (¾-1”) brass jet located inside the float bowl next to the needle jet/main jet location. The pilot jet meters the fuel required for engine starting, idling and the initial throttle opening 0-1/8. A lean pilot jet setting will cause your engine to surge at very low RPM’s, bog or cut-out when the throttle is opened quickly and have trouble idling down. A rich pilot setting will result in hard starting, plug fouling at low RPM’s, sputtering as the throttle is cracked opened. The pilot jet is not difficult to set. With proper air screw adjustment and a close initial setting from your engine tuner, fine-tuning should be painless. Once set the pilot jet is not terribly sensitive. You should only be required to adjust the setting when confronted with large weather changes or altitude swings of over 2000 ft. If adjusting the pilot jet gives inconsistent feed back, or does unexplainable things. Check and clean out the pilot/slow speed system thoroughly with contact cleaner and blow out with compressed air. [h=3]SLIDE:[/h]The slide not only monitors how much airflow goes into your engine (its main job). But it has various angles cut on the bottom of the slide to monitor airflow at low RPM’s. This is referred to as slide cut away. The slide cut away is measured in 4.0, 5.0, 6.0 etc. (see attached chart). The higher the number, the larger the cut away the leaner the slide setting is. The slide cut away generally effects the jetting in the ¼ throttle range at almost the same throttle position as the needle diameter effects. The slide cut away is usually predetermined by the engine manufacture or engine tuner. As a general rule do not change the slide cut away unless instructed to do so by a skilled engine tuner. For ¼ throttle jetting adjustments it is easier to adjust the needle diameter. 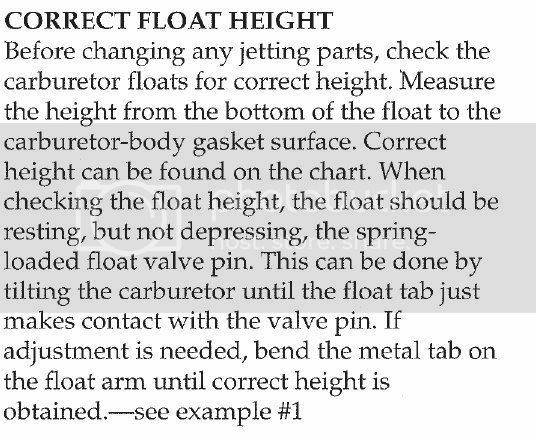 [h=3]NEEDLE:[/h]The jet needle is the most important component in determining your carburetors jetting. The needle is broken into 3 main functions; Diameter, Length, Taper. These needle functions have a large effect on the carburetors jetting from ¼ to ¾ throttle. In the following paragraphs we will explain the needles functions and how to adjust them. DIAMETER: The needle diameter controls the jetting just above the pilot jet, right as the engine begins to pull. On most engine combinations the needle diameter is felt in the ¼ throttle range. The setting of the needle diameter is crucial to both the engines low RPM power and reliability. The jetting at ¼ throttle is adjusted by changing the diameter of the needle. On gold colored needles identified with the 3 stamped in letter I.D. system the last letter refers to the needle diameter size. 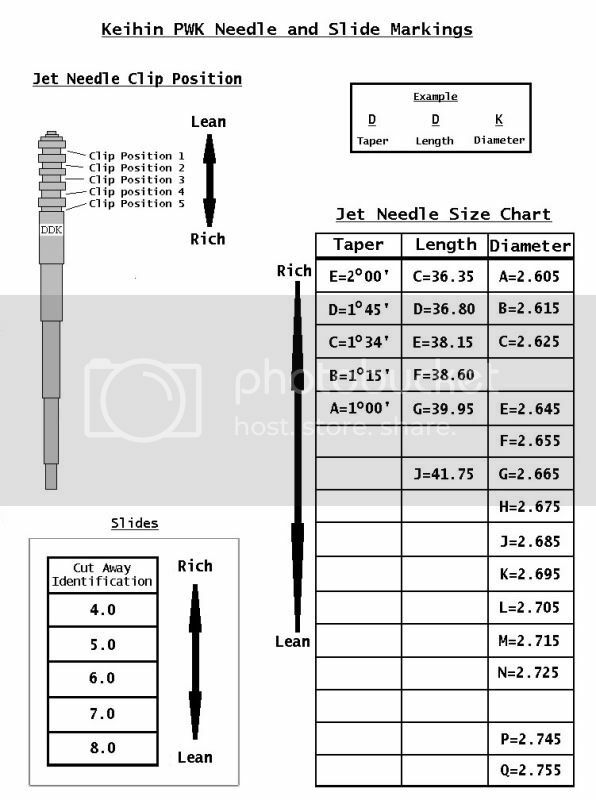 By referencing the enclosed jetting chart you can verify your needles size, and be able to determine what needle size may be required for your specific situation. In many instances you can leave the taper and length settings the same (if they are correct) and adjust only the diameter. 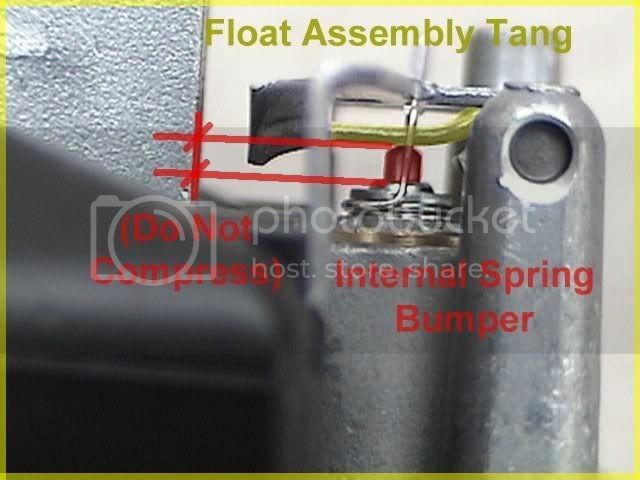 EXAMPLE: If you have a needle marked DGJ and change it for a needle marked DGK, you have effectively Leaned the jetting at the ¼ throttle position. 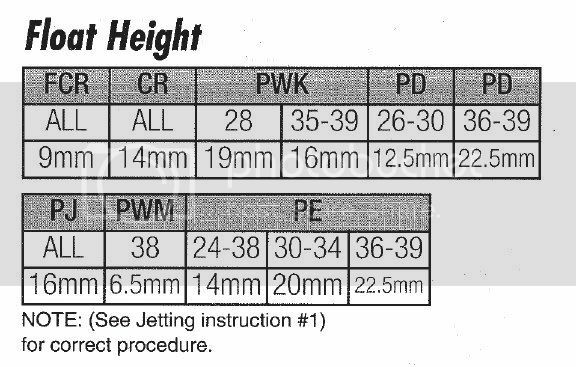 Reference the enclosed jetting chart to clearly understand this adjustment. When the needle diameter is Lean the machine will have a loss of low-end power. The engine will feel very zingy (like a 125cc engine). When an engine is in this condition and then put under a heavy load the engine becomes very susceptible to seizing. When the needle diameter is Rich the machine will sputter at ¼ throttle and be hesitant to take the throttle. In extreme cases the engine can feel like the choke is on or the plug is fouling. When the needle diameter jetting is set correctly the engine will accelerate evenly thru the first part of the power band. The proper diameter setting will provide maximum low RPM power and very ride able throttle response. 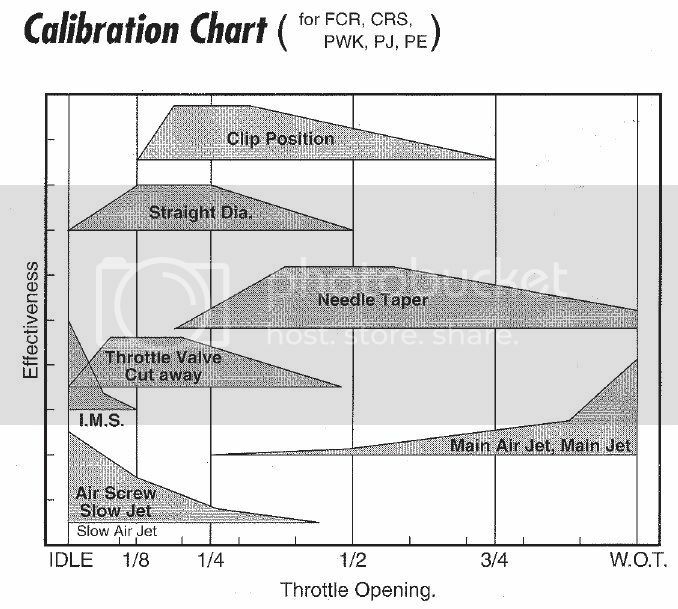 It is important to remember that even though the needle diameter is mainly responsible for the jetting at ¼ throttle there is some bleed effect. With experience this can easily be deciphered. An excellent way to pin point the feel of the needle diameter is test needles in your machine that have both the same taper and length but richer and leaner diameter settings. Try a needle of each setting in your machine for 10-15 minutes of riding and you will begin to understand specifically what throttle position your dealing with. LENGTH: The needle length is determined by the clip position (grooves at top of needle) setting on the upper portion of the needle. On most needles there are 5 clip positions. The top clip position is referred to as #1 and is the Leanest setting. The clips are referred to in numerical order with the bottom position being #5, the Richest (refer to attached jetting chart illustration). The clip/length setting covers the largest percentage of jetting in your carburetor. With an emphasis at ½ throttle, the clip (length) setting will bleed both up and down to some degree to cover a wide portion of the midrange jetting. When the clip/length setting is Rich the machine will have a lazy feeling in the midrange. Exhaust note will be a little flat sounding. In extreme cases of richness the engine will even sputter or kind of crap out in the midrange. The safest way to set the clip position is to richen up the clip position setting until the machine loses a little power (feels lazy/unresponsive) then lean it back one position. Ideally you like to run the needle setting in either the 3rd or 4th clip position, if possible. The needle clip jetting is especially critical to your machines reliability because on average more time is spent in the midrange than any other part of the throttle. Most machines pull very hard in the midrange, putting quite a load on the engine. This makes a lean condition very detrimental to your reliability. TAPER: The needle taper is the angle of the needle at its lower half. The taper works the transition between the midrange and full throttle/main jet (¾ throttle position). The taper is the least sensitive function of the needle. Changes in the taper have very mild subtle changes in the jetting. The taper also affects the main jet size your carburetor requires. 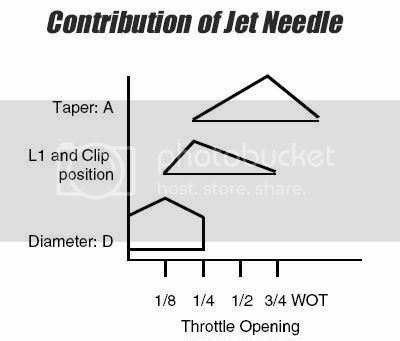 A leaner needle taper will use a richer main jet than a comparable engine/carburetor combo with a richer needle taper. As a general rule, your engine tuner or engine manufacture should preset the taper. Once set correctly by a professional the taper setting should not need to be changed except for cases of extreme temperature reduction. [h=3]MAIN JET:[/h]The main jet affects the jetting in the upper quarter of the throttle position. Coming into play at ¾ throttle on through to full open throttle. Even though most people relate the main jet to their carburetor in general. The main jet is only responsible for the last ¼ of the jetting. The main jet does not effect the jetting for starting and idling. It plays no part on low RPM or mid RPM jetting either. The main jet is very important to your machines overall tuning, but should never be over emphasized at the expense of needle tuning or other facets of your carburetion tuning. When the main jet is Lean the engine will experience detonation or “pinging”. Exhaust note will be of a higher, tinier type note. Engine will over heat easy and can be down on horsepower. A moderately lean main jet can cause engine seizures. A severely lean main jet can cause the engine to burn a piston (whole in top). When the main jet is Rich the engine will be a bit flat or lazy at ¾ to full throttle, giving off a flat, dead sounding exhaust note. When the main jet is severely rich the engine will sputter in the high RPM’s and have a lot of trouble making power up top. As a general rule, richen the jetting up as long as the engine likes it and continues to run just as well or better than the smaller size main jet previously installed. When the engine no longer continues to improve its performance you will know you have gone to far.